The RBA released its biannual Financial Stability Review yesterday, offering the usual trove of insight to anyone interested in such troves. 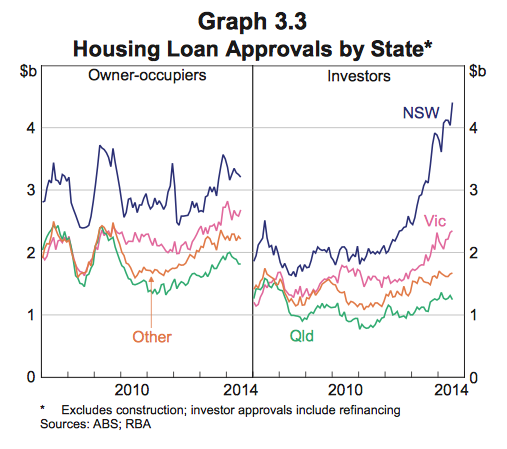 The low interest rate environment and, more recently, strong price competition among lenders have translated into a strong pick-up in growth in lending for investor housing – noticeably more so than for owner-occupier housing or businesses. 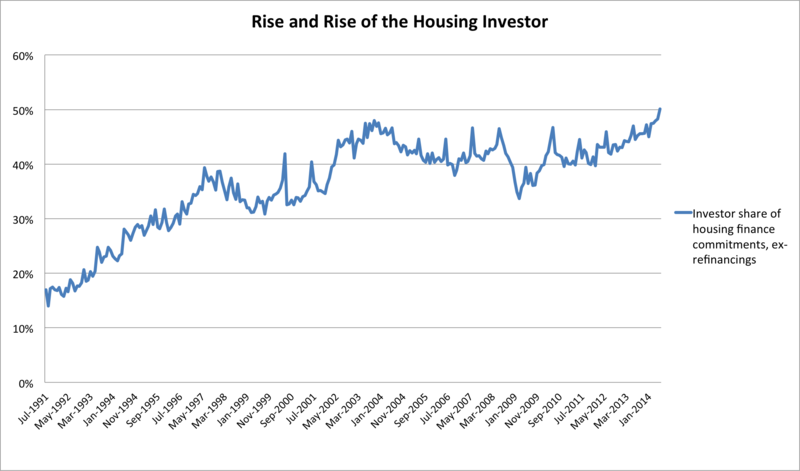 Recent housing price growth seems to have encouraged further investor activity. As a result, the composition of housing and mortgage markets is becoming unbalanced, with new lending to investors being out of proportion to rental housing’s share of the housing stock. Australian banks are benefiting from improved wholesale funding conditions globally and, in turn, an easing in overall deposit market competition. Lower funding costs are facilitating strong price competition in housing and commercial property lending. 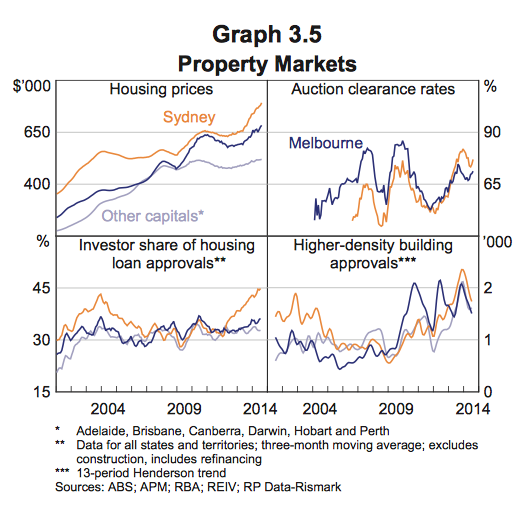 Fast growth in property prices and investor activity has increased property-related risks to the macroeconomy. It is important for macroeconomic and financial stability that banks set their risk appetite and lending standards at least in line with current best practice, and take into account system-wide risks in property markets in their lending decisions. Over the past year APRA has increased the intensity of its supervision around housing market risks facing banks, and is currently consulting on new guidance for sound risk management practices in housing lending. The pick-up in household risk appetite that was evident six months ago appears to have continued, as has the associated willingness to take on some types of debt. Housing prices have been rising strongly in the larger cities. To some extent, these outcomes are to be expected given the low interest rate environment and the search for yield behaviour of investors more generally, both here and overseas. However, the composition of housing and mortgage markets is becoming unbalanced. 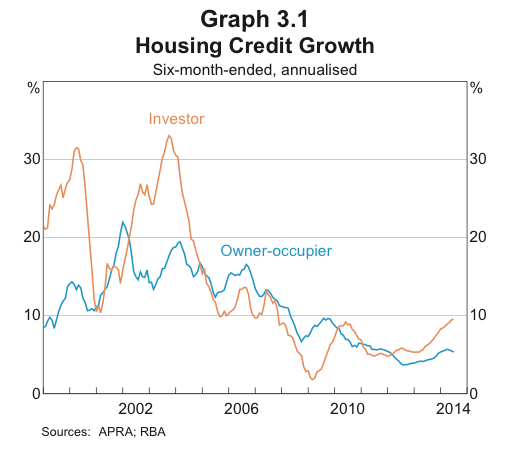 Nervous about housing and laying much of the blame at its own feet (low interest rates). As I’ve said a number times, the robust housing sector is the one area of the economy that argues for higher rates, whereas slumping commodity prices, the wind-down in mining investment and weak domestic demand generally all argue for lower. A look through the Review’s charts helps elucidate the situation in housing. I have previously discussed the property investment frenzy which took hold in the early years of the millennium, and this is clearly visible in the above charts (note the investor share of housing loan approvals includes refinancing in that chart, my own chart did not). Indeed, by the standards of 2003-04, the current run-up in investor borrowings looks paltry. However, it must be remembered that we began from a much higher base in 2013. Moreover, the national figures mask the fact that the current boom has been centred on Melbourne and Sydney, with the latter easily accounting for the most fevered activity. This we can observe in both the pace of house price appreciation in Sydney (above) and the parabolic explosion in investor loan approvals (below). The RBA believes the primary threat this poses is to real macroeconomic conditions, rather than to the stability of the financial system (which would exacerbate the damage the macroeconomy, of course). For now, I think this is a fair assessment, since we haven’t seen the kind of deterioration in lending standards that usually characterises bubbles that go on to destabilise financial systems (though this is heavily dependent on how serious the terms of trade downturn gets). The adverse impact of falling prices on lenders occurs when loans repayments become impaired; house prices can fall without borrowers necessarily defaulting, provided they have sufficient net worth to weather the capital loss on property assets. Low net worth buyers are simply being priced out of the market, so the argument goes, and therefore we don’t need to worry about surging non-performing loans in the event of a property downturn. 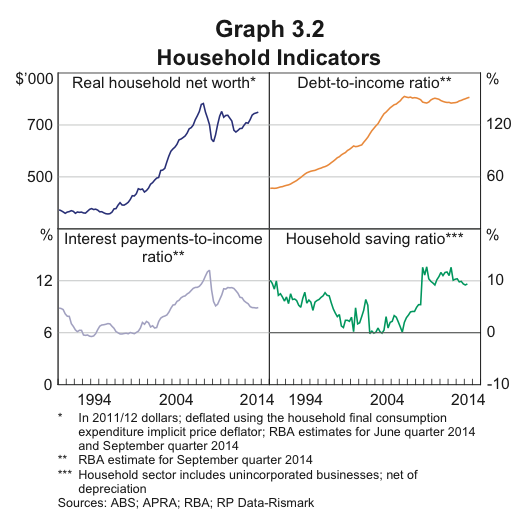 Nevertheless, Australian households remain highly indebted, and the debt-to-income ratio is exposed to a shock to incomes arising from the falling terms of trade and resource-sector investment. So even if the banking system doesn’t suffer systemic instability, there is still scope for the housing market to hit consumer spending. To my mind, the issue is that housing risks inflicting a wealth shock on Australian households at the same time that they experience an income shock due to the unwinding of the twin booms in the terms of trade and resource-sector investment. Households exhibit measurable propensities spend out of their current income, which is hardly surprising, but spending patterns also react to changes in wealth. By allowing house prices to appreciate as they have, policymakers added another unwanted risk to the economy as it enters the post-boom adjustment. If the housing boom was primarily a response to low interest rates, and if little else in the economy argues for higher rates aside from booming housing, then the RBA is plainly in a bind. The economy would be suffering grievously today if the RBA hadn’t reduced the cash rate over the period it did (late 2011 to late 2013), but it now has a disconcerting housing boom on its hands as a result. As it turns out, this is a widespread dilemma which many developed economies have had to contend with in recent years. 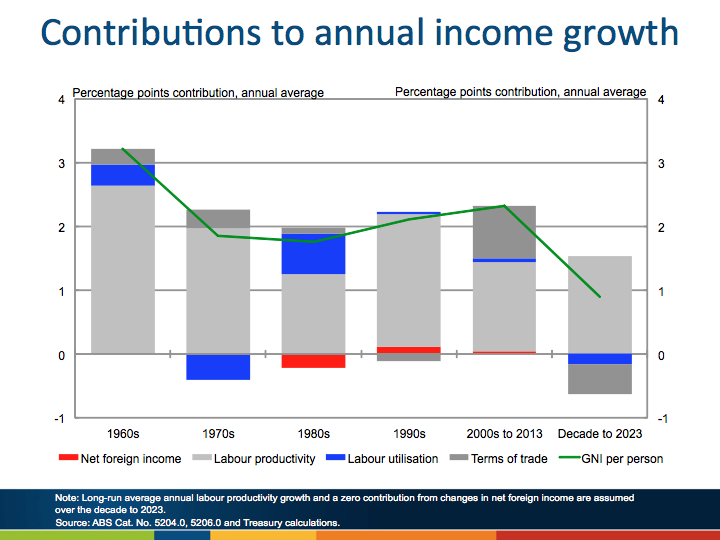 Largely due to structural changes in the global economy, over the past decade and a half, many developed economies have faced low inflation and weakening labour markets (especially amongst low-skilled workers). The popular prescription to this problem was to lower interest rates. As it turned out, lower interest rates exhibited a tendency to drive credit growth and asset prices higher, to a much greater extent than goods and services inflation. This was a challenge to orthodox thinking on economic policy. A suite of policy tools have therefore been gaining popularity since the GFC as a way of addressing this conundrum. Known as macroprudential regulations, these tools are aimed at curtailing the speculative excesses that tend to appear when interest rates are low, thus avoiding the need to hike interest rates in environments that would otherwise not warrant them. The Economist has a useful primer on macroprudential policies. The RBNZ introduced macpru policies last year, chiefly restrictions on high loan-to-valuation residential mortgages, and this seems to be having the desired effect. 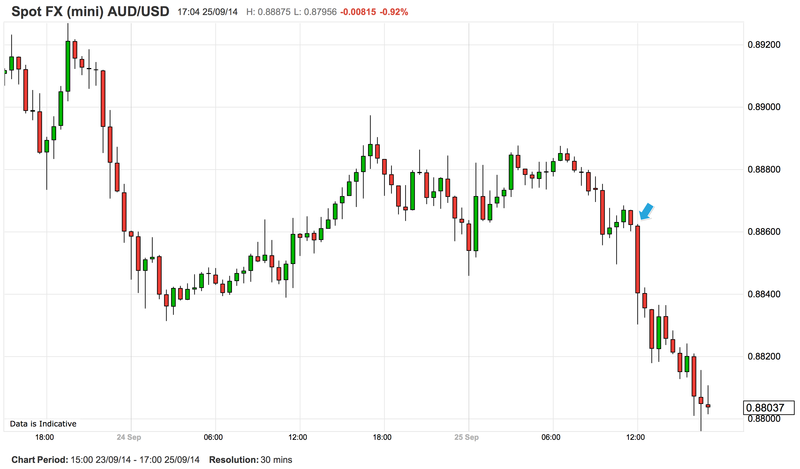 After vocal calls for the RBA to adopt (through APRA) a similar approach in tandem with its cuts to interest rates, we are finally seeing some receptiveness on the Bank’s part. I have highlighted the relevant comment from the Review, which strongly suggests regulators are preparing to introduce these policies. Then, early this afternoon, we received virtual confirmation that the RBA will push ahead with macpru controls to address the investor segment of the property market. This is a most welcome development and sensible policy. Stevens is correct that there is little downside to experimenting with these policy options, which was always one of the foremost points of recommendation. 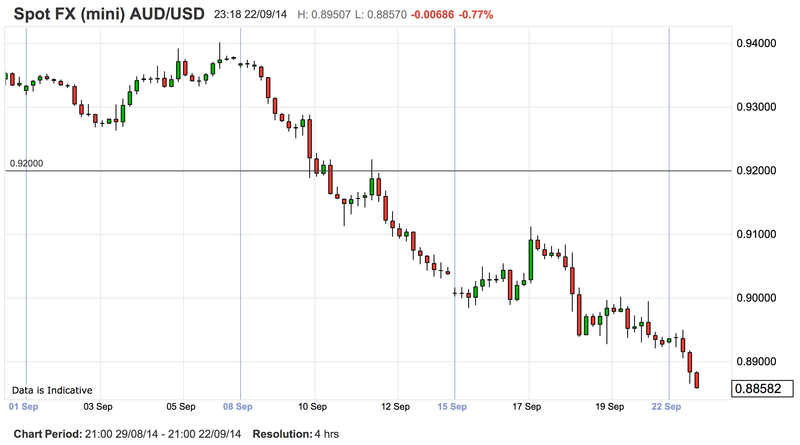 The AUDUSD was hammered on Stevens’ remarks; the FX market knows as well as I do that the investor property boom is the chief factor holding up interest rates! 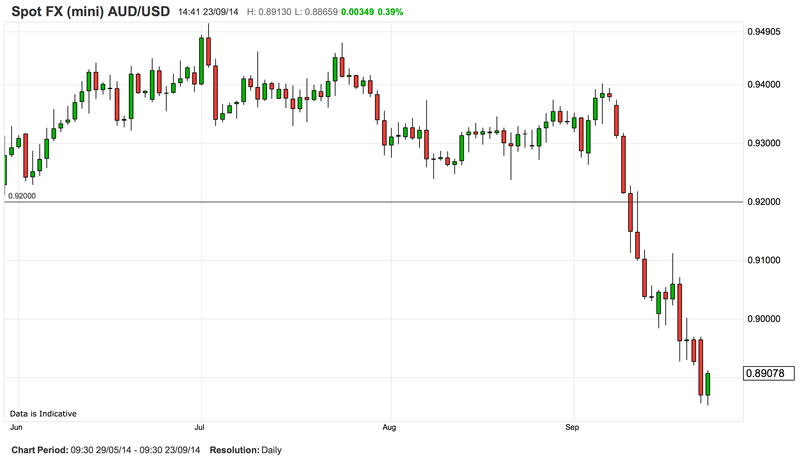 This entry was posted in Uncategorized and tagged Australia, interest rates on September 25, 2014 by MJV. The HSBC flash PMI for September was released this morning and showed a slight bounce, coming in at 50.5 on expectations of a flat 50, from 50.2 last month. Full report. This survey is broadly in tune with the trends prevailing in the Chinese economy at present. These are; ongoing structural adjustment of growth patterns, a property sector shakeout, and abating price pressures in industries suffering overcapacity, especially those tied to the property sector (i.e. steel). Without knowing precisely what is driving rising export orders in this survey, it is reasonable to surmise a significant contribution from steel exports (improving US demand for consumer goods is likely the other main factor). 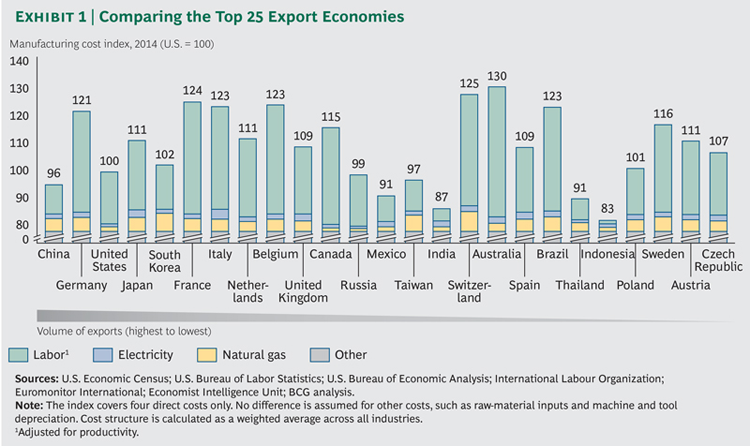 The most recent reading on the steel industry showed weakening domestic demand, partially offset by surging exports. Chinese steel products are becoming the solar panels of previous years, with sizeable excess supply being dumped into global markets after years of over-investment in new capacity. This process looks to be accelerating sharply now owing to weak domestic demand. We have already seen signs that foreign governments will not tolerate this indefinitely. With steel prices still sliding (the most-traded rebar contract was down again this morning, despite the PMI), the tidal wave of steel hitting global markets is unlikely to slow any time soon. 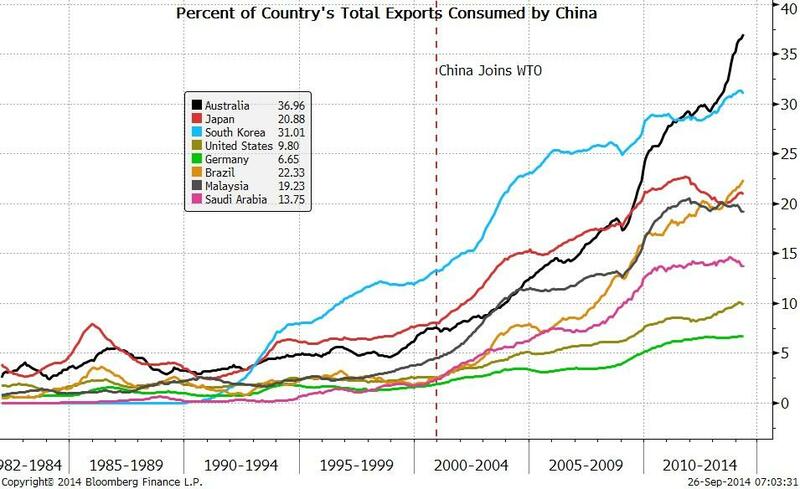 It will be very interesting to see how long it takes for an international backlash to turn China’s excess supply back on to itself. 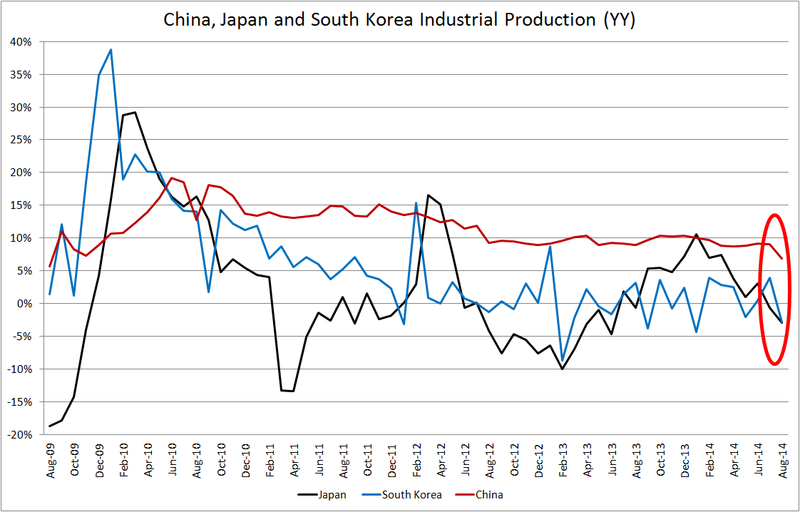 The situation in the steel market is a neat microcosm of the broader state of the Chinese economy. When the GFC hit, China switched its primary source of final demand from foreign consumption demand to domestic investment demand. Without external surpluses, China had to flood its economy with credit to facilitate extremely high investment levels. Now that China is approaching the limits of this growth model (willingly, for now, but note that the adjustment would have been forced upon it eventually had the government persevered with debt-funded investment spending), any help it can get from external consumption demand would lessen the slowdown it must endure as it rebalances its economy. In other words, trade surpluses will help China ‘grow out’ of its debt burden. The question is, Are other countries able and willing to run the corresponding deficits to enable China to pursue this policy? 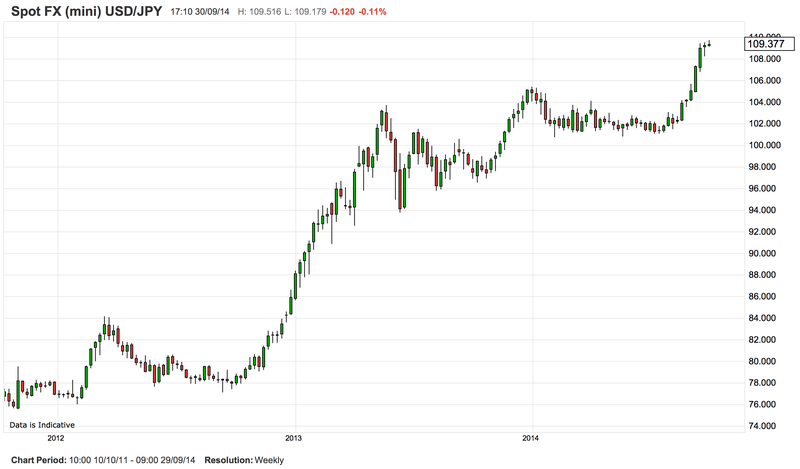 A USD bull market means the US could assume the role of international debtor nation, but whether it is foolish enough to adopt that model again, so soon after it proved so ruinous, is a question I would rather not speculate on. Anyway, for now Aussie markets are enjoying some much-needed relief courtesy of the better-than-expected data, which isn’t especially surprising since both equities and the currency looked oversold on a short-term basis. 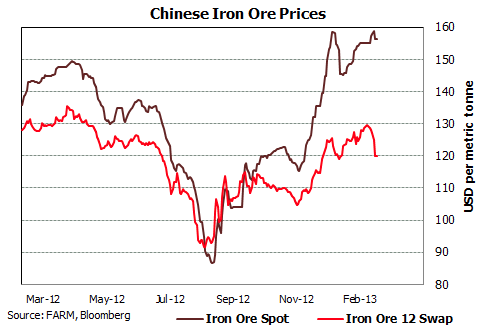 No relief for steel or iron ore futures today, despite the PMI lift. More at the usual place. 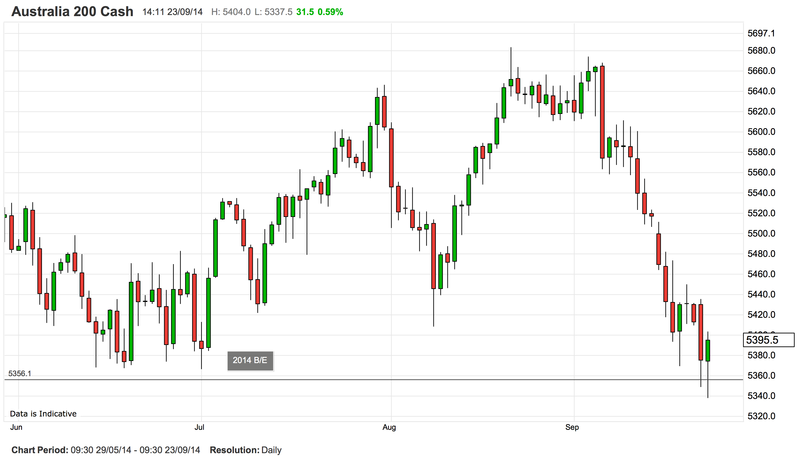 SPI futures and the AUDUSD are giving up their gains accordingly, though sagging European growth prospects are certainly weighing on equities markets generally this evening. 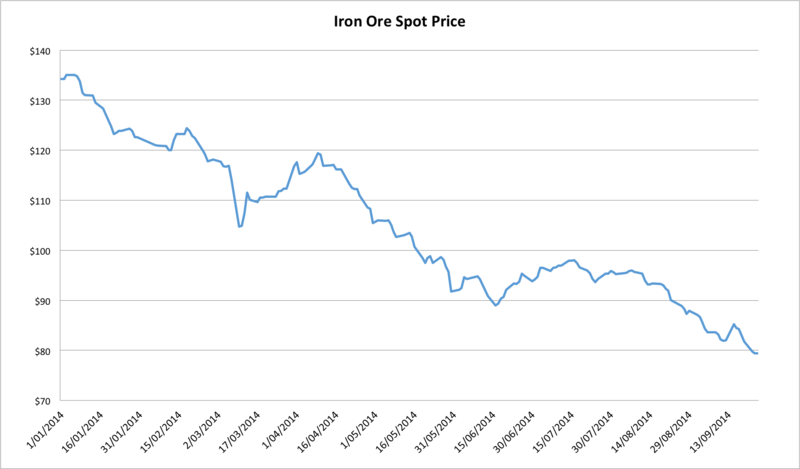 Yesterday I mentioned the horror show that is the WA budget, which has become reliant on frankly ridiculous forecasts for iron ore prices. 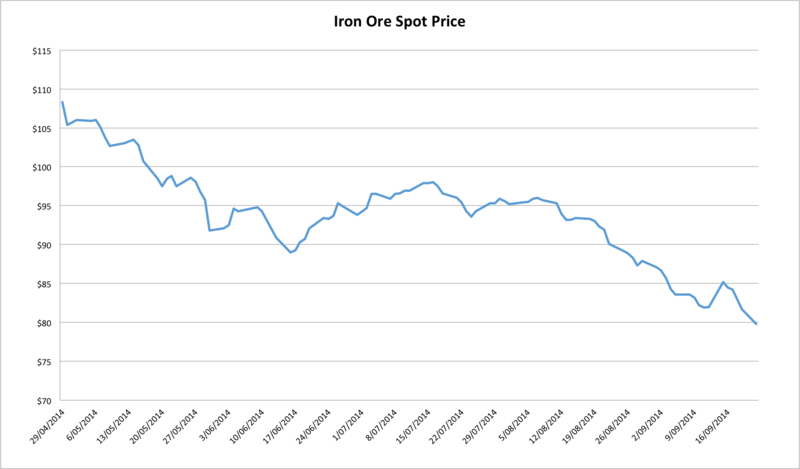 Today we finally received an admission from the Treasurer that current prices are starting to fray nerves in the West. Gone are the days of WA’s GST largesse being redistributed to the laggard states of the Federation. This is not good news for my home state of South Australia, which is grappling with its own budget mess. As an aside, the current government may blame the industrial composition of the state for its economic travails, but it certainly cannot blame the Federal government for its public finance issues. The ALP has been in power in SA since 2002, it has had ample time to address the weaknesses of the economy. Instead it came to rely far too heavily on the promise of Olympic Dam, to the detriment of its own budget position. 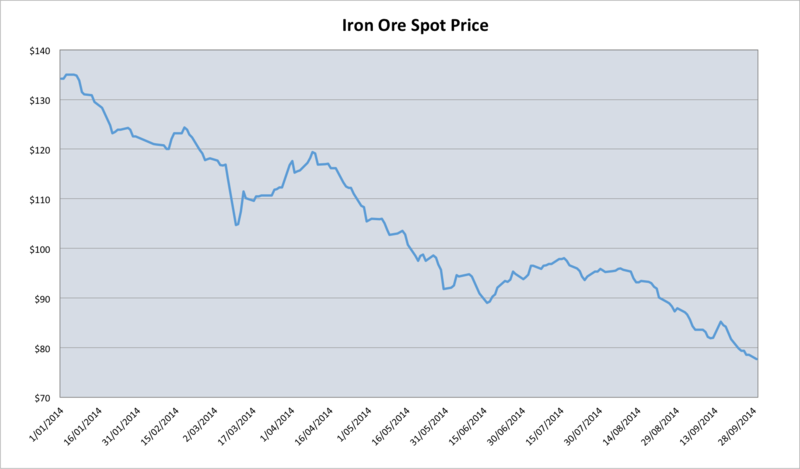 This entry was posted in Uncategorized and tagged China, HSBC, steel prices on September 23, 2014 by MJV.